Sofreh aghd will be set up at green area and it will be decorated with ivory coloured chiffon and fresh flowers (silver mirror, silver tray, swarovskı candlesticks, glasses will be designed by pearls and flowers, flowers balls and candles will be set us as well ). Ring pillow in decoration colour will be prepared.runner will be put on the table, adorned with ivory coloured chiffon bow ties, 2 fresh flower sets will be on long metal stands and will be placed on both sides of the Sofreh. White lacquered chairs will be decorated with cream coloured chiffon bow ties. 6 artificial flower decorations on high metal stands will be set up at the bridal walking way. A white carpet will be rolled out and rose leafs will be spread on it. At the entrance of the Sofreh venue, yard door will be set up and will be decorated by artificial flowers. Ladders will be set right and left side of the door and uniquely design by flowers and lanterns. artificial flowers that will used in decoration are pastel colours like pink and white. Professional DJ, Iranian and international music. A bottle of special wedding champagne for Bride and Groom. One glass of champagne will served for guests, aerial shooting with drone. At entrance door of balroom, white color columns will be set up and will be designed by theme colored satin fabrics and decorate with fresh flowers. 2 sides of the door will be docarated by 4 sizes cylinder glass vasez . these vases will be filled with water and transparent Stones. Fresh flowers, Calla, and roses will be putten inside the vases and will be adorned by floating candels. Between the vases, mirrors will be set up on the floor and candles will be on top of them. Place will be lighten by projectors. The initials of Bride’s and Groom’s names will written on a special board and will be placed at the entrance. 2 gold coloured jardinieres decorated with artificial flowers will be set up under the board. The Bridal table will be prepared special. It will be decorated with crepe and white coloured chiffon drapes. The tables will be decorated with fresh flowers in shape of ovel. and other accessories, fresh flowers inside small vases will be put on the table. under plates with Swarovski stones will be set up, the napkins will be tied with Swarovski stoned napkins bracelet. Swarovski stoned candles and candle holders also will be set up. in front of the table, big glass vases will be decorated by big candles with special design. 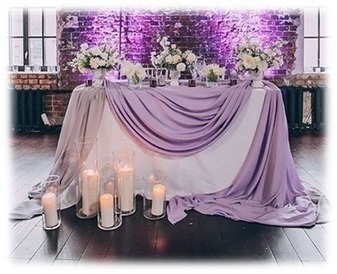 The Tables of the guests will be decorated with ivory coloured chiffon and satin. Lace table runners will be on it. In the middle of the table big square mirror will be set. Big glass vase will be put on the mirror and will decorated by fresh flowers. Swarovski stones will be hanged from the edges of vase. mirror under plates will be set up. Napkins bracelet made of pearls will be used for satin table napkins. Beautiful candles are placed on the candle holders. White Tiffany chairs are decorated with ribbons of ivory chiffon. A bride walking trail with 6 artificial flower decoration on high metal stands and are set up. They are also decorated with ribbons of ivory chiffon. Special prepared Bridal bouquet and the groom’s collar flower with fresh flowers. Marriage Certificate and sand ceremony will be given as our Company’s gift. 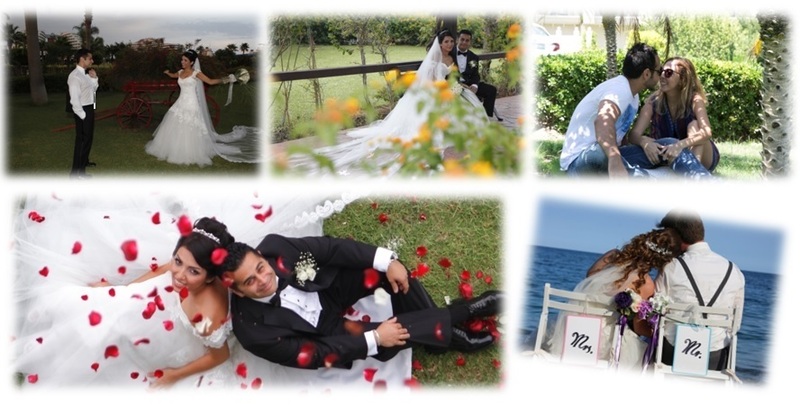 Wedding City Antalya Team will come to the Hotel at 09.00, will serve up to 24:00 o’clock.